Champions PayCommerce wins the Goal 2017, The Corporate Cup Soccer League. Champions PayCommerce wins the Goal 2017, Corporate Cup Soccer League. “Soccer” regarded as one of the most popular game over the world. Bodybuilding, the sport that is long ignored and misunderstood in India. 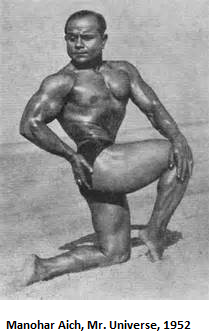 Manohar Aich, The second Mr. Universe from India who won it in the year 1952 is no more (The first being Monotosh Roy in 1951). He passed away on Jun.05, 2016 at the ripe old age of 104. He had been the inspiration behind number of promising Bodybuilders from India, who have gone ahead and reached great heights in Bodybuilding. Notable among them are PremChand Dogra, Satya Pal and countless others. I am one of the privileged few who met this legend and learnt the intricacies and fine techniques of Bodybuilding. With already a loss in the first league game for us in Goal’15; we came back with a never before seen energy and motivation. We had to win this game by a margin of atleast 4-0 to make it to the top of the league. The team was in spirits and looking forward to the match. Though a scoreline of 4-0 looks unrealistic, we were hoping for this margin. On the D-day, we had our opponents as VI Point Solutions. With the heat catching up in Goal’15 (the InfoPark football extravaganza), PayCommerce had a crucial match against NeST coming into the League games. A match we could not afford to lose. I made it to the ground for the match and the PayCommerce team was just getting into the mode for playing. The team readied up and had a few stint with the ball. With a win the previous day against Zerone Consulting, we were raring to go in the next game. The game began with the customary hiccups normally associated with our team and with a few supporters on the ground. As seen in the last round, Kreata Global too had a large backup of players to let the players roll on effortlessly. It was the tight situation for us. With just 2 players to roll on, we had to walk the tightrope every game. Hey Folks!!! We are back with this year’s Goal-2015 edition. With mixed success last year and surely with superlative performances in patches; this year we are back with more firepower and more conviction. Hey, Remember the last blog I put across for the Futsal Football competition and our PayCommerce team making its way to the top 3 amongst 32 teams. It sure was a big achievement for us. Sunday, when the whole of Kochi is lazing off on this day, we had our second match against EY at 9 in the morning. As I indicated in the earlier writing that most of our loss in transfers have been to EY and we did lose a lot in this transfer. This was evident with serious repercussions as seen in the match today. The cycle goes back full circle to the day, yet another Saturday. The date was April.28, 2012. This Saturday too, we lost the match against a tough opponent EXL-OPI. Today, we lost to a bigger opponent, Cognizant.